Now availiable in a convenient 3 pack, Jim Clark's famous Clarkspoons feature a built in swivel system which eliminates line twist. This feature is exclusive in our product and not found anywhere else. Also all Clarkspoon models have been diamond shaped to achieve maximum reflection and are equipped with a colored bead are both proven fish attractants. 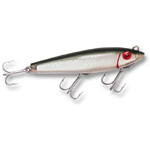 Whether you are fishing for fresh or saltwater game fish, Jim Clark's Famous Clarkspoons continue to be one of the most widely used lures among professional anglers world wide.